In my last entry, I explored the history of the plot of land where the office I work in is located. Today, we’re going to start looking at how some of the buildings on our campus came to be. But first, because I’m a fort nerd, let’s take a look at a little bit of the history of the defenses of Baltimore. Probably the fort that immediately springs to everyone’s mind when you talk about Baltimore is Fort McHenry – focal point of the Battle of Baltimore. Located on Whetstone Point, it was completed in 1800, and was thought at that time to be placed so that it could effectively defend Baltimore from naval attack, and clearly it did in September of 1814. As weapon technology improved and population expanded, it was decided that the defensive line would have to be moved farther out from the city in order to provide sufficient protection. This led to the construction of an artificial island off Sparrows Point that would become Fort Carroll. Even though it was never fully completed as designed (and it was never tested by an enemy) it served for a number of decades in the middle of the 19th century. The grand march of technology continued on. By 1886, it was known that the coastal defenses of the United States were obsolete once again. New techniques involving smaller but more numerous gun emplacements, combined with naval mine fields became the preferred approach during the Endicott Period. Baltimore’s defenses were upgraded to this new system right around the turn of the 20th century. Fort Carroll was overhauled, and new installations – Fort Armistead, Fort Howard, and Fort Smallwood (just up the road from our campus) – were constructed. All of these were abandoned as defensive measures by the 1920s because of the arrival of another technological advance: military aircraft. At first, this new threat was countered with the installation of several anti-aircraft gun batteries at strategic points around town, but when jets – and soon thereafter supersonic jets – came on the scene, it became clear that gun crews wouldn’t be able to shoot the new faster planes down. The Army began researching a different approach, leading to the creation of the world’s first operational surface-to-air missile: the Nike Ajax. All through the 1950s and into the early 1960s, over 200 Nike sites were established in the U.S. to protect targets of military, government, or industrial value. The system consisted of a few elements. The missiles themselves were 38 feet long, with a two-stage rocket motor: the first being a solid fuel booster that would get the weapon off the ground and on the way to its top speed of over twice the speed of sound. Once fully airborne, the booster would drop off and a second sustainer engine would propel the missile to its target up to 30 miles away, delivering three powerful, high-explosive fragmentation warheads. A ground tracking and control station (called Integrated Fire Control, or IFC) used three separate radars: one to search for incoming targets and determine whether they were friend or foe, one to lock-on to and track the intended target aircraft, and one to lock-on to and track the missile. With the locations of both the weapon and the target known, a ground-based computer (usually located in a semi-portable trailer) would calculate an intercept course and send guidance signals to the in-flight missile by radio. Once the missile was close enough, the detonation signal would be sent, sending flaming shrapnel ripping through the sky toward its target. A diagram of how the Nike Ajax radar tracking and guidance system worked. It is also important to note that the whole idea was that bombers wouldn’t ever make it to our shores (which of course they never did). If everything went according to plan, any incoming threat would be intercepted by Air Force or Navy fighters somewhere over the Atlantic. These Army missile installations only existed to be a last resort in case anything slipped through. I wonder a bit about what it must have been like to serve on one of these bases. They’re very small, and the work is highly technical. I get a picture in my mind of a group of nerdy guys – what with all the computers, radars, and radios involved – sitting around waiting for doomsday to show up at the door. One of the most interesting things I’ve come across is a few of the recruiting materials for the Nike program. They really play up the idea that you can join the Army and serve in the U.S. near a big city (as opposed to, say, a jungle in southeast Asia). You can go to football games, and meet girls! A Nike Recruiting Brochure from 1973. Sadly the program ended in 1974. It must have been stressful for the local folks, too. I can imagine that having a missile base move in to your literal backyard would be quite unnerving. Community members had lots of concerns about housing for soldiers, danger from the missiles themselves (the potential for accidents, for example), where exactly these first-stage solid rocket boosters would be landing after they drop off, and even the possibility of their neighborhoods becoming targets of attackers or saboteurs. Luckily, the Army had answers for all of these concerns, and assured the locals that having a Nike site move in next door is really no more dangerous than having a gas station around the corner. The missile fueling procedure. Safety first! Baltimore was included in the list of protected areas because of its manufacturing centers, port facilities, and proximity to Washington – in fact the Baltimore / Washington area was treated in many respects as one combined zone since the cities are so close together. Anne Arundel County hosted three installations: W-26 outside Annapolis near the Chesapeake Bay Bridge, W-25 near Davidsonville (both part of the Washington defenses), and our own BA-43 at Jacobsville (which was protecting Baltimore). Our Jacobsville site came to be as the army was searching for “tactically suitable new base sites” around Baltimore, according to a January 5, 1955 article in the Baltimore Sun. By December, construction was underway on the facility that would one day become our offices. A 1966 aerial view of our complex. The site seems quite large, but was only around 36 acres in total. Nike installations actually consisted of three sites: the IFC site, the Administration site, and the Launcher site. 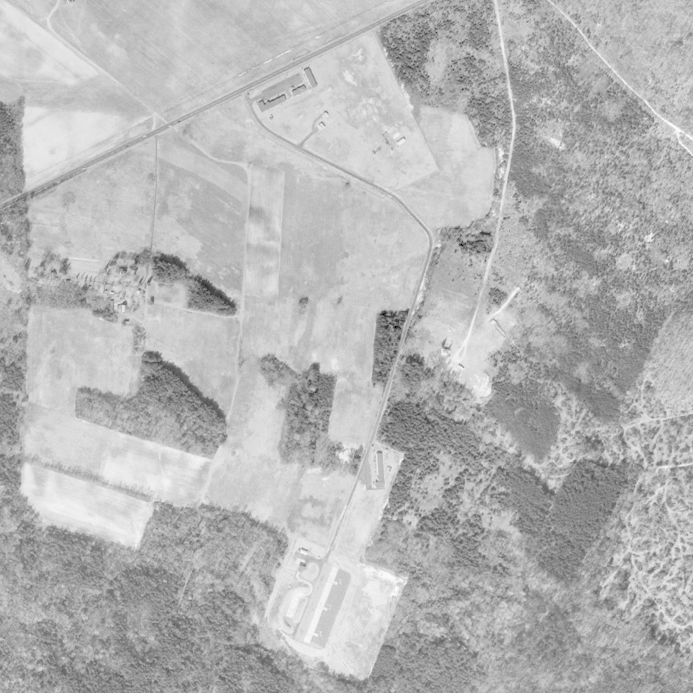 In the case of BA-43, the IFC and Administration sites were combined on one plot. The important thing was that the IFC and Launcher sites had to be separated by at least 1,000 yards because otherwise the missile-tracking radar wouldn’t be able to keep up with following the supersonic weapons as they launched vertically. 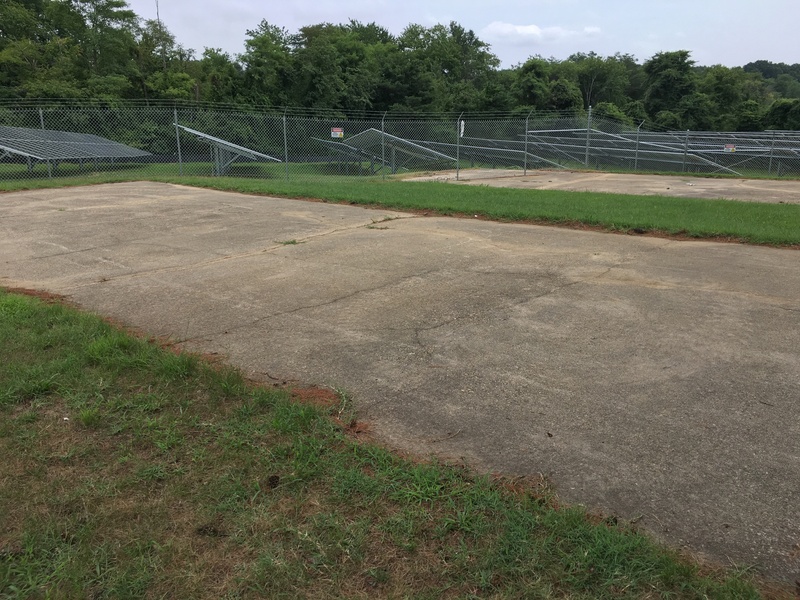 At this point, I should note that the grounds I’m describing here are school system property, and that they are treated as a secure facility – complete with fences, cameras, and various alarms. Please be respectful of those boundaries and don’t trespass. Time has brought significant changes to both of BA-43’s sites. I’ll be detailing some of the reasoning behind that in a future post, but for now just know that these are very out-dated photos. Unit Insignia of the 36th AA Battalion; The first to serve at BA-43. BA-43 was initially manned by the U.S. Army, Battery C of the 36th Antiaircraft Artillery Battalion from 1956 through September of 1958. A Captain, serving as the battery commander, would be the ranking officer on-site, with the full headquarters for the battalion – responsible for the Baltimore / Washington defense area – located at Fort Meade. 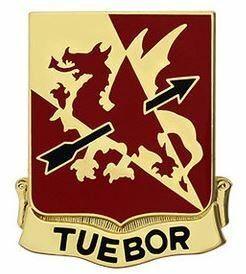 Unit Insignia of the 562nd ADA Regiment. In September of 1958 things changed in the way that the Army wanted to categorize these types of units. In the resulting re-organization, BA-43’s garrison became known as Battery C of the 1st Battalion of the 562nd Air Defense Artillery Regiment. I think this change was due to bringing more sites online, and that a battalion-sized unit may not have been able to support the number of soldiers that were now in place in some of the larger defense areas like New York, Los Angeles, or Baltimore / Washington. 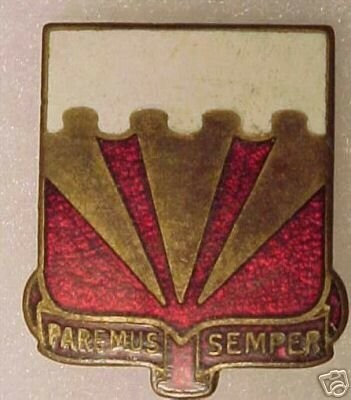 Unit Insignia of the 70th ADA, Maryland National Guard; The Last Unit Stationed at BA-43. This arrangement remained in-place for BA-43 until 1960. 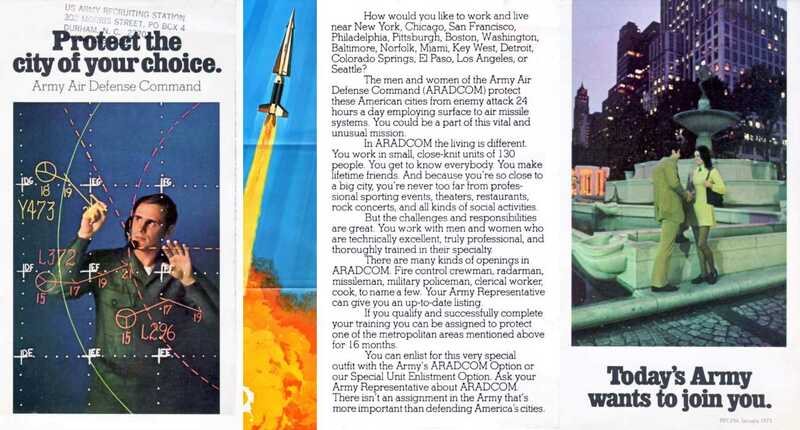 The Army had started converting some of the bases to use the larger, faster, more powerful Nike Hercules missile (which sometimes even carried a nuclear payload). BA-43 didn’t make the switch to the new weapon. Instead, the Army decided to turn over the sites using the older style Nike Ajax to local National Guard units. This was done to save on some costs, as guardsmen could commute to the base and pack a lunch (removing much of the need for barracks and mess facilities). In March of 1960, BA-43 was turned over to Battery A of the 1st Battalion of the 70th Air Defense Artillery Regiment, Maryland National Guard. This unit would be in control of the site until it was shut down in December of 1962. I’m pleased to report that the weapons of BA-43 never had to be used against an enemy. As the 1970s approached, the threat from Soviet bombers became superseded by the threat from Soviet ICBMs, and while an attempt was made to create an anti-ICBM Nike missile (the Zeus), it was ultimately decided to end the Nike program in 1974. I started this post with a brief overview of the history of Baltimore’s defenses because I think that here we have a great illustration of the incredible progression of technological advancement in the 20th century. Fort Smallwood – just at the tip of the peninsula – was completed in 1905, and was thought at that time to be positioned to provide an adequate defense of Baltimore. By 1927, it was abandoned because it was made obsolete by new technology. Thirty years later, the land just 2 miles south of Fort Smallwood – the place where BA-43 was constructed – was only useful defensively as a last resort. Within 6 years, that purpose was even made obsolete. It’s a remarkable pace of change. Ed Thelan’s Nike Missile Website – An amazing wealth of information on the Nike program. It’s easy to get lost exploring all the resources he’s collected. The Nike Historical Society – Another great site with lots of stories from Nike program veterans. When I first started working for the Anne Arundel County Public Schools Facilities Department last year, almost immediately I noticed some interesting things about the building where our offices were. You could tell that there had been a lot of modifications made to it over the years: walls had been moved around, network and telephone cables are strung near the ceiling along the main hallway, a variety of windows and doors are used throughout – things like that. Clearly, this was not a building that had been designed from the outset for the purpose it was fulfilling today. In that first week, a few of the guys asked me if anyone had taken me out back to see the “missile silos”. When I asked my boss about it (thinking that maybe this was some kind of initiation-of-the-new-guy thing) she confirmed that the campus we occupied had once been a military installation. Being the military history nerd that I am, I just had to look into the history surrounding our office. What I found was both interesting and surprising, so I figure: what better way to record that history than with a series of blog posts? The area now known as Pasadena, MD has seemingly always been a peninsula, though the bodies of water surrounding it have not always been so large as they are today. The melting of Canadian glaciers over many thousands of years raised the sea levels to the point where most of the original native settlements are now suspected to be under water. It is believed that the current water levels have been consistent for probably the last 2,000 – 3,000 years. When Captain John Smith came up the Chesapeake Bay in 1608, he didn’t encounter any native people in this area, but archaeological evidence points to habitation by the Powhatan tribe of the Algonquian people, who had a series of semi-permanent camps on the peninsula during that time. They would have fished, hunted, and done some limited farming. Arrowheads, tools, storage vessels (of both clay and gourd), as well as evidence of fabric have all been found in the area. By the middle of the 17th century, European settlers had begun to move in, with all the land on the peninsula probably being claimed by the 1690s. This northern part of Anne Arundel County was then known as “Town Neck Hundred” and was heavily wooded. One of the first things to be done by the settlers was the clearing of those forests so that tobacco fields could be established. Tobacco was the cash crop of early colonial Maryland, and land owners (as well as their investors) wanted to generate healthy profits from its sale as quickly as possible. Land grant maps from the 1700s show the location of my office as being in a tract called “Poplar Plains”. Not much physical evidence remains on the landscape from that period except for Hancock’s Resolution, a house built in 1785 about 3 miles east of our department’s buildings. Population remained sparse well into the 19th century. The 1850 census shows barely more than 2,000 people living on the entire peninsula, most of them farmers. The crops had changed though: tobacco was out, and corn was in. Some were also growing wheat, plums, apricots, and strawberries. The village of Jacobsville came into existence around this time as well, centered around the present-day intersection of Mountain Road and Armiger Drive. A structure (presumably a general store) dating to the late 1850s is still visible there. Martenet’s 1860 map of Anne Arundel County shows a structure labeled “Johnson’s Store & P.O.” at that location. Between there and Rock Point (present day Fort Smallwood Park) a label for “J. Meek” marks the vicinity of our modern-day complex of buildings. During the Civil War, southern sentiment prevailed among the people here. Though it remained with the Union, Maryland was still a slave state until November of 1864, and almost 1/3 of the residents of what is now Pasadena were slaves. Only a few men from the peninsula served with northern units in the war. More men followed their convictions and left home to join Confederate units in Virginia. Others who stayed behind were later certified by a local doctor as being “unfit” for service in order to avoid the draft that was instituted. There are also stories of men who were drafted avoiding the army by sending one of their slaves to act as a substitute in their place (people could do that back then). The numerous waterways, combined with the agricultural and political character of the area led to a sizable smuggling trade, with sympathetic farmers loading up blockade-running ships full of supplies for the Confederate forces. In the post-war years, the loss of slave labor created problems for the farmers still trying to work the land and harvest their crops. Most seem to have started transitioning away from grains to fruits and vegetables, and these “truck farms” were able to find ready markets for those products in Baltimore and Philadelphia. Labor issues were alleviated by the wave of immigration coming from eastern Europe, especially in the 1880s. The 1878 Hopkins Map of Anne Arundel County’s Third District shows the area of our offices being held by “Robt W. Chard”. Population and structures remained sparse. Around the turn of the century, the beaches of the peninsula became a popular tourist attraction, with many people making the trip by boat from Baltimore during the warmer months. Roads were almost nonexistent here at the time, and since these visitors were arriving at, and remaining close to the shore, they made little impact on the farms in the interior of the peninsula where our complex of buildings is located. Seemingly for decades, life went on as it always had, except that the name “Pasadena” – brought along by a group of people who had immigrated from California – was now being used to describe the area. Fruit and vegetable farming remained very productive. By 1910, Anne Arundel County was known as the strawberry capital of the United States, and it is certain that the fields surrounding Jacobsville made their contribution to that reputation. 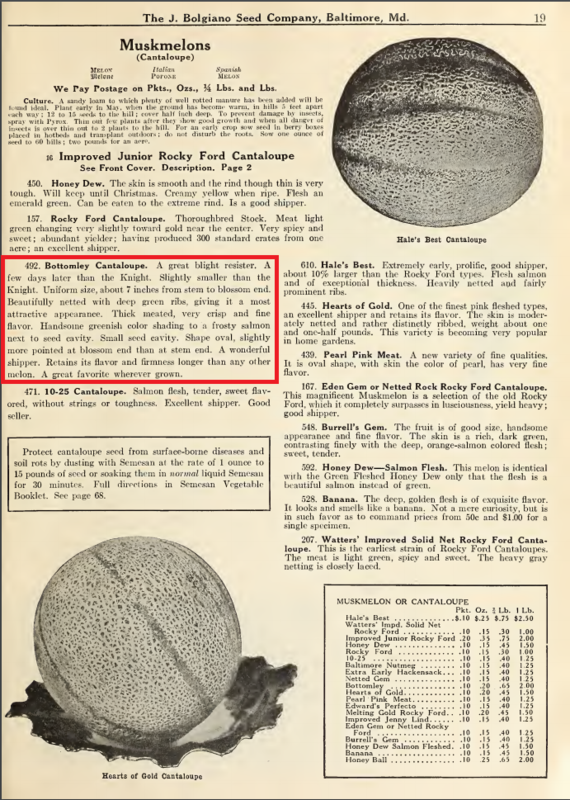 In addition to strawberries, the plot where our offices are now located also grew a distinct breed of cantaloupes and other types of fruits and berries. The living conditions on the farm at the time appear to be quite primitive. Immigrant families lived transient lives, never really putting down roots anywhere, but having to follow the seasons south and north looking for whatever work they could find. This photo shows a broader vista of Bottomley’s Farm. This is the land that would eventually become our building complex and the Compass Pointe Golf Course that surrounds us. The pace of change began to accelerate rapidly in the 20th century. In particular, 1932 brought both the electrification of the majority of the peninsula, and the completion of Fort Smallwood Road. The advent of the automobile meant that more of the area’s farmers were purchasing trucks, and as the road system improved, they were overwhelmingly choosing to ship their produce to market over land instead of on the water by the 1950s. But the middle of the century would bring even more changes to the Pasadena area. The threat of Soviet bombers bringing nuclear destruction upon nearby Baltimore caused the Army to start looking for ways to defend against that possibility. I’ll be exploring that topic further in the next post of the series.